The 14 Proterra Catalyst E2 buses purchased for the DC Circulator have been delivered and will go into service next week in one of the highest profile public transit routes in the country – Washington DC’s National Mall. 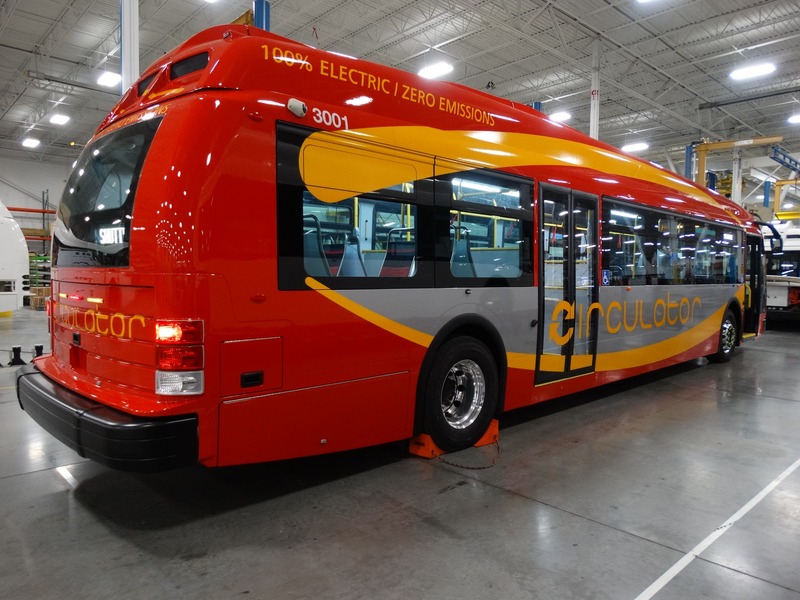 The brightly wrapped buses aren’t shy about the high tech powertrains that propel them around the nation’s capital but rather, they proudly proclaim their status as 100 percent electric, zero-emission vehicles proudly as they go about their routes. Breaking that down into more digestible metrics, electric buses, like those offered by Proterra, are simply more efficient than their fossil fuel counterparts. The proven savings and efficiencies of electric buses are even more attractive when the extreme pricing fluctuations of diesel and CNG are taken into account. In contrast, electricity prices are extremely stable and can even essentially be purchased up front by installing a solar system or wind turbines to provide electricity for a fleet. These musings aren’t just data on a spreadsheet but rather, are being taken seriously by transit agencies around the country, with early adopters like Foothill Transit in Southern California and the Los Angeles Metro, which have both committed to migrating their fleets to electric buses over the coming years. 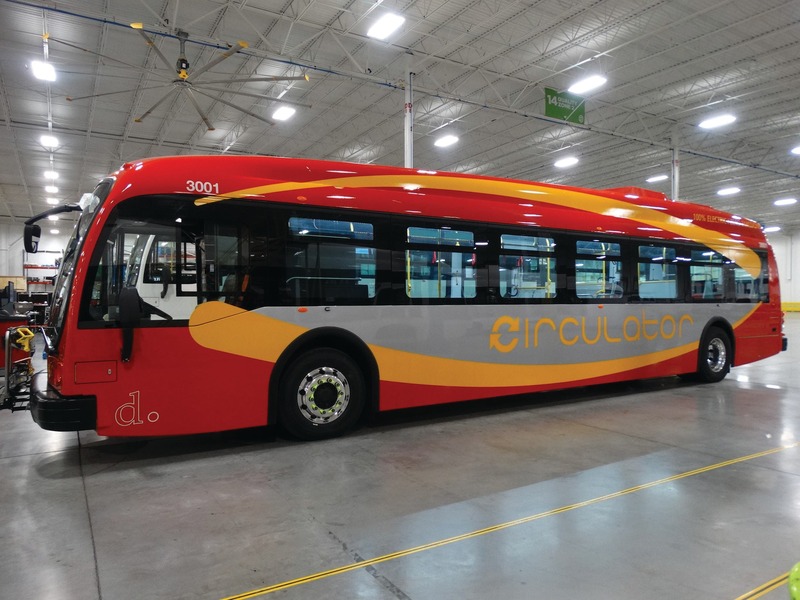 The purchase of the buses for the DC Circulator is not just another pilot but rather, represents the first purchase of what has become the new standard for public transit — electric buses. Matt shared that these transit authorities are not just the early adopters, they are the first of the early majority. “Now, there are more than 20 transit agencies in US cities that have said formally that they are no longer buying fossil fuel buses and are 100% battery electric in their planning.” Just this week, New York City got on board with the program, proclaiming that it would fully convert its fleet of 5,700 buses to electric over the next 2 decades. The Proterra Catalyst E2 buses purchased for the DC Circular are absolutely loaded, with 440 kWh of batteries allowing them to drive for the entire day without needing to charge. The buses will return to the depot at night where they will charge up on normal DC Fast Chargers equipped with the SAE Combo CCS adapter. The fact that Proterra’s buses use a standard charging adapter that is shared with passenger vehicles makes it that much easier for cities and counties to electrify fleets over time that can share the same charging infrastructure. 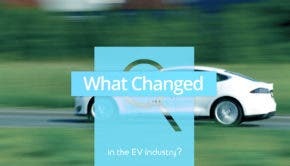 It’s easy to look across the pond at China, where entire cities have converted entire fleets of thousands of buses to electric, and get discouraged at relatively low adoption rates in the US, but Matt shared that there are significant differences in the markets that need to be taken into account when comparing the two. Back in North America, things are set up very differently, with much fewer incentives for electric buses compared to China. “While the FTA does provide funding for all transit bus purchases, there is a much, much smaller set of financial incentives in the US. So things are proceeding a little more slowly but the outcome is no less certain.” To make up the gap, American markets are taking a much more capitalistic approach, with private capital stepping into the gap with new financial products that allow transit agencies to finance the purchase of the batteries to eliminate the up front capital constraint. Digging into the specifics, Proterra’s buses have come down from $1.2 million USD each to around $700,000 USD today, with the bulk of the savings coming from lower battery costs. This can be seen across the industry and is also receiving a carry-on effect of increased scale. As costs come down, more customers order buses, which gives Proterra more purchasing power to buy batteries at higher volumes and better prices.